Sonim’s leather pouch is made in the USA, using premium leather and a patented, riveted d-ring for an ultra-reliable hold. 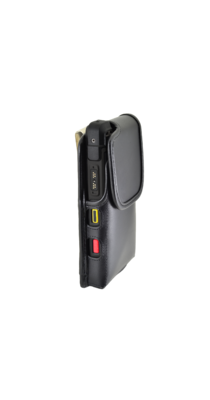 The durable leather pouch was custom designed to support the entire handset back-facing into the pouch, and to provide access to all handset controls and features. The innovative d-ring attaches to the included metal belt clip, or optional belt loop attachments. There is a built-in elastic strap that may be used as a pen or stylus holder, or lanyard or tether loop.